Purchase your copy of zMUD. zMUD is the fastest and most versatile MUD/Telnet client for PC/Windows, with over 50,000 registered users. This sophisticated GUI client supports multiple character windows (multiplaying), aliases, triggers with complex pattern matching including regular expressions, macro keys, variables, speedwalking, spell checking, automatic map generation, equipment database, graphical buttons, extensive built-in and user-defined functions, ANSI color, Simutronics game support, VT100 support, MSP, MXP, MCP, MCCP support, GSL, Pueblo emulation, word wrapping, alarms, and online help. It is fully customizable and 90 percent compatible with TinTin++ clients. Compatible with proxy servers and firewalls including SOCKS5. Windows 95, 98, ME, 2000, XP, and NT supported, including Windows XP Theme support. NOTE: zMUD is not supported on Windows Vista. Use CMUD instead. As-you-type spell checking. Misspelled words are underlined with a red wiggle. You can right-click to get a suggestion of correct words. You can add words to your own dictionary, and even auto-correct your common mispellings. Dictionaries for many different languages are available. Uses the Open Source PCRE Perl Regular Expression Library. ALL Triggers now run from two to ten times faster. Full Regular Expression support is provided, including captured substrings, named substrings, and nested wildcards. Not only does every zMUD user benefit from the speed improvements, but advanced users can use the regular expressions for even more powerful triggers. Regular expression conditions are fully supported by multi-state triggers, providing more triggering power than any other MUD client. The Automapper module in zMUD has been rewritten from scratch to use an SQL database engine (using the MDAC database software that comes with Windows). This is the same mapping engine used in zMapper and zExplorer. zMUD map databases can be customized using the external zMapper program (available seperately) to graphically enhance your maps. Maps enhanced with zMapper can be displayed within zMUD when zMapper is installed using the automatic zMapper plugin for zMUD. The speed and stability of the mapper has been greatly improved. When you double-click on a zone, the zone is now loaded instantly. You can now speedwalk across multiple zones as easily as you speedwalk within a single zone. Speedwalk calculations are incredibly fast compared to any previous mapper. Options have been added for sending only a certain number of directions at once for MUDs that restrict speedwalking. Custom exit commands have been improved and can be mapped to standard directions for faster keypad walking through special exits. Portal commands have been added to support teleportation spells. The entire look and feel of zMUD has been updated for the modern Windows XP operating system. All users of zMUD will benefit from the more colorful icons used in zMUD. For Windows XP users, zMUD fully supports the XP Themes so that zMUD will look and feel like other applications on your computer. zMUD includes a full FTP client. Using the new #FTP command you can now download files to and from your MUD. You can even download a file directly into the zMUD Editor, and then Save your changes and have the file automatically sent back to the MUD. Great for world-building. 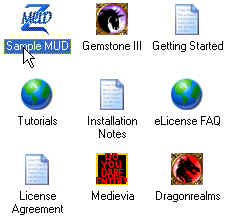 zMUD is the ONLY 3rd party MUD client that officially supports the Simutronics GSL protocol used in MUDs such as Gemstone and Dragonrealms. This support also provides inline image support via the MXP <IMAGE> tag, and Pueblo emulation for those MUDs that still support the old Pueblo protocol. Even without zMapper, you can create a graphical map as you walk around the MUD. A revolutionary feature for a MUD client! Don't be fooled by imitations...zMUD was the first MUD client to have an automapper, and it still has more features and compatibility with more MUDs than any other MUD client. Map handles 8 standard directions plus custom teleport directions, doors, multiple levels, one-way links, room colors, multiple zones, custom labels, and much more. Double click on a room and it will automatically speedwalk you to the room from wherever you are using the shortest path, even across zones! The Settings Editor (used to create and edit aliases, triggers, keyboard macros, etc) has been redesigned to work more like Windows Explorer. Classes are now folders and can be nested and contain other settings. Setting type (alias, trigger, etc) are like file types. Multiple windows can be opened and settings can be dragged and dropped between windows to easily exchange settings with others. User-definable database for storing information on equipment, monsters, other players, etc. Can be queried and scripted from the command line, or you can use the powerful GUI interface. Windows can be dragged together to tile horizontally, vertically, or on top of each other using window tabs. Once you have the windows set up the way you want, use Save Layout to save your arrangement and zMUD will always remember how you like your windows arranged. Chat with other zMUD or MUD Master users using the zChat plugin for zMUD. Supports scripting and PGP encryption. Plugins can be written by others. The Prompt plugin shown here is included in the zMUD Developer's Kit as an example of what can be done. COM-based plugins are also supported. Advanced Windows interface supports fullscreen MUD windows, rollup and rolldown of dialogs, stay-on-top windows, restoring of last window size and position, and auto tiling for multiple windows, all configurable by the user. All text output in zMUD, including dialog prompts, menus, buttons, etc can be easily translated to a different language. Language files for German, Italian, and many other languages should be available soon. You can also use this feature to completely personalize zMUD. Color highlighting shows you at a glance zMUD command keyboards, variables, etc. Syntax errors in your settings are indicated. Popup help as you type helps you learn how to write scripts. Debug your scripts by stepping through them a line at a time while monitoring variables in zMUD. Set breakpoints on script lines, or on access to items such as variable value changes. Keep track of values such as Hit Points, Mana, etc using visual gauge buttons. Appearance and size can be completely customized. Class folders can be nested for better organize your settings. Menu items can now be used to form nested submenus. Match commands sent to the MUD against patterns and alter the command before the MUD sees it. execute commands based upon patterns received from MUD. Sophisticated pattern matching functions and expressions are provided. Advanced multi-state triggers are also supported. both built-in and user-defined functions. zMUD contains a full-powered programming language, including DDE support. let you record directions to MUD locations, and even play them back in reverse. Customized commands can be added. Also includes an innovative concept known as SlowWalking - safe walking based upon triggers that lets you create robots. Write your scripts using the built-in zMUD scripting language, or use familiar languages such as VBScript or JScript. The #WAIT command has been rewritten to work more as expected. #WAIT can now be used within loops to better control timing of commands. Access any Windows COM object from a zMUD script. Control your email from within zMUD! Global variables, aliases, buttons, and menu items provide even more customization of zMUD. Using global menus and buttons you can alter the main zMUD menu and toolbar. keeps a database of all of your MUD characters, and detailed notes for each one. Uses an Explorer-like interface to make it easy to select the character you want to play. The master MUD listing from the MUD Connector is now loaded instantly and can be searched quickly by keyword. Makes it easier to browse the over 2000 MUD games on the Internet to find one you like. command history of last 20 commands. The default of 20 can be changed to save any number of past commands. Supports multiple characters in multiple windows and methods to send commands to different windows. Can also capture text and send it to a secondary window. Window captions can be placed on the left side to provide the maximum number of text lines. Global status icon shows you the state of the MUD even when zMUD is in the background. allows you to enter long strings of text by typing the first few characters and then pressing <TAB> to fill in the rest. Dynamic Shift-tab completion fills in the string from text received recently from the MUD. log your session to a file for review at a later time, including the ANSI color information. a built-in timer allows you to take control of ticks, while another timer tracks the amount of time connected to the current MUD, as well as keeping track of the total time you have ever played a particular character. Alarms execute commands at certain times or intervals. automatically sets up a login script when you first connect to a MUD. provides both a GUI interface as well as a traditional command line interface. Output can be scrolled and word-wrapped, and window can be split to view scrollback and current text at the same time. full ANSI color support, including an ANSI editor for composing long messages or for builders working on room descriptions. Also has full VT102 support, including scrolling region for MUD status lines. The MUD eXtension Protocol (MXP) supports HTML and XML-like tags. The MUD can use these tags to better control the look of the MUD output. Support for full 32-bit color, text font changes, text attributes (bold, italic, etc), hyperlinks, embedded command links and right-click menus, and MUD relocation and login tags. This is an evolving open specification that several MUDs are contributing to. Unlike previous attempts to bring HTML to MUDs, MXP has built in security and it tailored specifically to telnet sessions, rather than strictly adhering to the HTML standard. The Mud Client Compression Protocol (MCCP) allows the MUD to compress the text sent to the client. Your compression savings can be monitored within zMUD. More compression means zMUD can handle more MUD output for faster text scrolling. Especially useful during battles. zMUD also supports Simutronics GSL, Pueblo emulation, full Telnet Option negotiation, and character-mode Telnet for remote shell usage. No other MUD or Telnet client supports the full range of standards that zMUD does. 90% compatibility with TINTIN and TINTIN+ text-based clients. Even includes a command to import your TINTIN++ scripts and convert them to zMUD scripts. built in support for SOCKS4, SOCKS5 and Telnet proxy servers. A 32-bit version developed and tested for Windows 95, 98, ME, 2000, XP and Windows NT 4.0. An older, free 16-bit version is available that works under Windows 3.x. Windows XP Themes supported. extensive online help system provides both reference and examples. Context-sensitive command help is also a keystroke away. Complete Help file is also available online. Get help from other users and from zMUD Programming Gurus quickly via the web-based support forums. zMUD is customer driven. This means that when you suggest a new feature or improvement, it is added to zMUD in one of the next versions. zMUD is updated regularly to fix bugs and add new features. You never pay for an upgrade to zMUD. Why should you pay for bug fixes? Zugg, the Developer of zMUD, answers technical questions via email personally. Zugg also answers questions on the Discussion Forums. This page last updated on March 12, 2004 .